What is the advantage to buying 4 sets in this kit versus 1 set when only one can connect to the PICO at a time? I want to buy the NVH system but am not sure which kit to purchase. 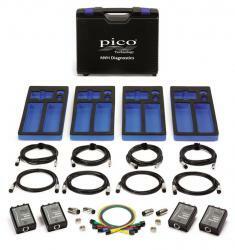 I will have one PICO scope. Is there an advantage to having 4 sensors units versus 1 sensor unit since the PICO will only accept one of the sensor units? The advantage is that more sensors give you more locations to sample from shorting the amount of diagnostic time spent moving the accelerometer around and taking multiple test drives. This is not necessary for all NVH diagnostic but can be a huge time saver for the more difficult to diagnose problems. A kit with a single 3-axis sensor can only sample readings from one location at a time. This is fine for most vibrations that can be felt throughout the car and the accelerometer is placded on the seat rail, but there are cases where you may need to use the accelerometer in a different manner. After identifying a potential engine mount vibraiton. checking engine mounts would require placing the accelerometer on the engine side of the mount, and then moving it to the frame side and trying to compare the differences wth a single accelerometer. With two accelerometers and two modules you could place one on each side of the mount and take measurements simultaneously. With four, you could perfom the test on two mounts at one time. Extra transducers and modules can also be helpful when used for checking pops and creaks of the suspension and body. Placing several transducers or microphones in multiple locations is better than moving one between multiple test driver. Another common use for wheel bearing is to place a transducer at each suspected hub and then place a microphone on a 3rd channel in the cabin. There is also an option to use one 3-axis transducer and an additional single axis module to create a 4-axis input. This helps in identifying the location of some vibrations or noises.